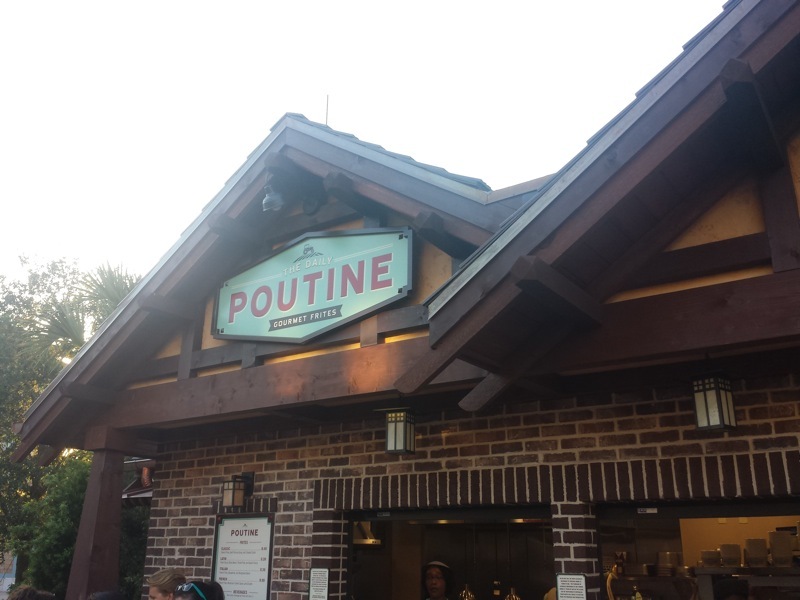 The Daily Poutine is one of the newish restaurants which opened in the new section of Disney Springs. They are fast food with some nearby outdoor seating. I was a big fan of trying the different versions of poutine when I was in Quebec last year, so I was excited to try some Floridian theme park poutine. 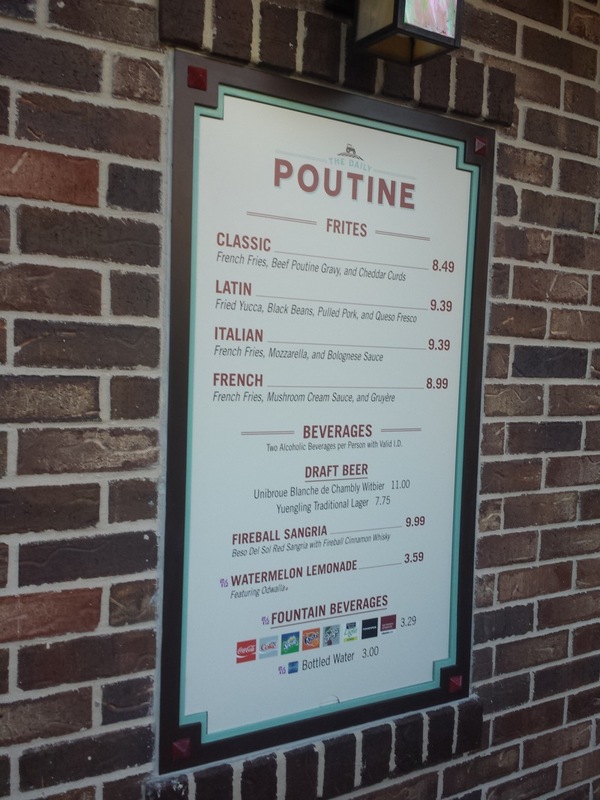 I am not a poutine expert, but I wonder how many of the menu items here would be considered true poutine by connoisseurs of the food? When does a variation of the dish become something else? Looking at something like the restaurant's Latin Poutine where potato fries are replaced with yucca and there isn't gravy or cheese curds, would this still be considered poutine? 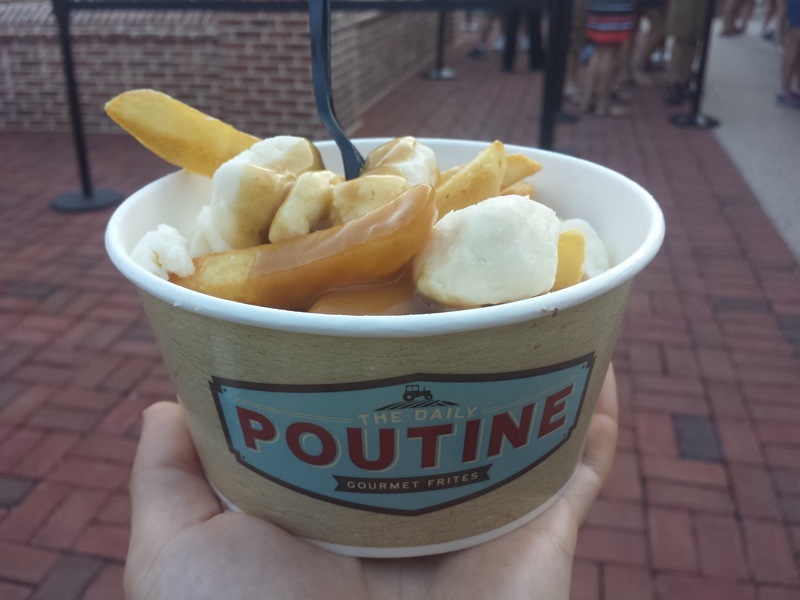 The second time I dined at The Daily Poutine was when I was intrigued by their All-Day Breakfast Poutine. I'm not sure if this is a daily special or a temporary menu item, but it was advertised on signs sitting on the counter. 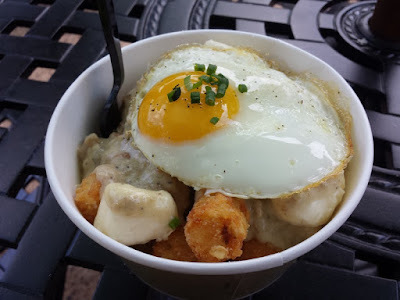 It was described as fried potato puffs, sausage gravy, and cheddar curds topped with a fried egg. Again, this was veering away from what I think of poutine with tater tots instead of fries and white sausage gravy instead of brown gravy. Regardless, this breakfast poutine was actually really tasty. The gravy had a lot more flavor compared to what I normally think of when it comes to white gravy. I've been liking foods topped with fried eggs lately, so that topping made me like the poutine more. I've been to Toasted in Winter Park a few times now. They specialize in fancy grilled cheese sandwiches and burgers. I've tried a grilled cheese on every visit. On one visit I tried the Fig and Goat. 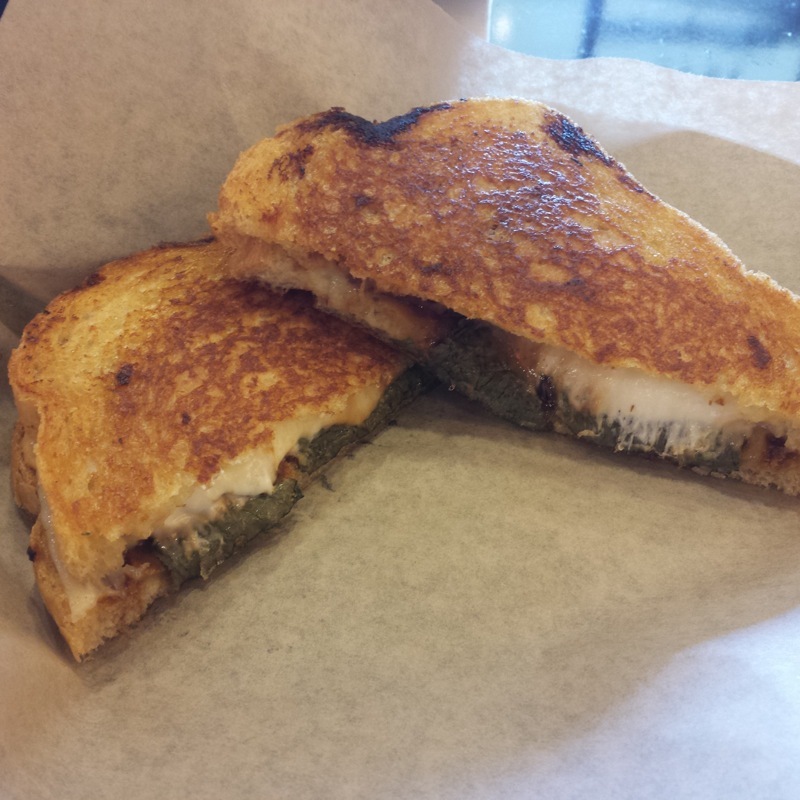 This grilled cheese was filled with havarti and goat cheese, fig, basil, and honey. Good flavors with a nice contrast of sweet fig and honey and savory cheese and basil. The bread was the most disappointing part of the grilled cheese. I had the Blackberry Melt on another visit. 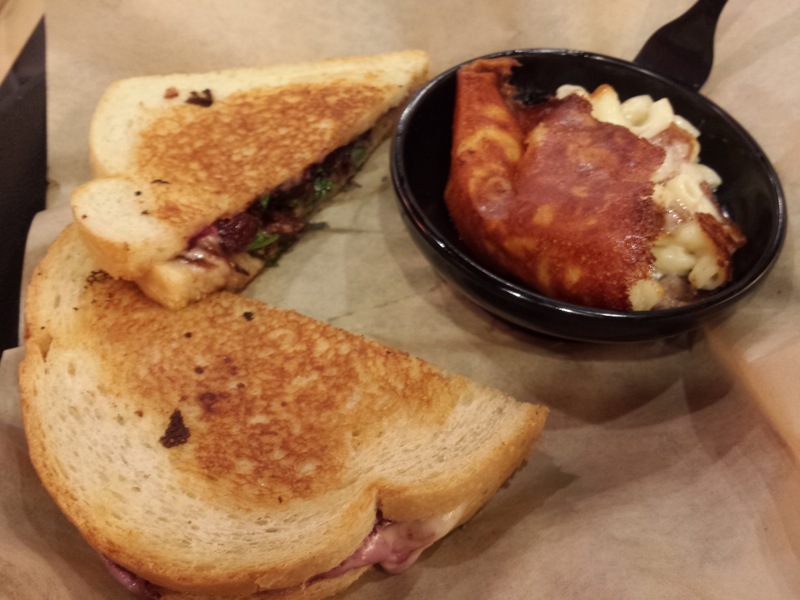 This grilled cheese had fontina cheese, bacon, blackberry, and arugula. Again, it had a nice contrast of sweet and salty. They used bacon bits instead of sliced bacon which was a little disappointing. Again, the boring white bread was the weakest part of the sandwich. The blackberry melt was still pretty tasty though. Of the two sandwiches, I liked this one the best. I ordered this with a side of macaroni and cheese, which was just okay. This is the last of blog posts about my recent trip to the UK. On this post, we leave the big cities a bit and find some food. We will start out in Bath. I took a bus tour to Stonehenge and Bath. While in Bath, I bought myself lunch at a restaurant called the West Cornwall Pasty Co. My only experience with Cornish Pasties in the past was at the Three Broomsticks at Islands of Adventure, which I wasn't too impressed with. I was excited to try a British food actually in England. Being that the sign said they were award winning made it even better! The Cornish Pasties were folded over pies, similar to empanadas or calzones. They had a large selection of fillings available, but it was suggested I go with the Traditional Cornish Pasty, filled with beef and onions. I liked it. It reminded me of a shepherd's pie without the potatoes on top. I ordered the combo which was served with chips and mushy peas. During my trip to the United Kingdom, I took a train to Scotland and stayed overnight in Edinburgh. My train arrived around noon. I found out I couldn't check into where I was staying until 2:00, so I decided to have lunch at the Theatre Royal Pub on the next block until I could drop off my bags. As the name implies, they were next to Edinburgh's big theater. Unlike the pubs I visited in London where you ordered your food at the bar and then claimed a table, the Theatre Royal Pub was full service from start to finish. Just to confuse American tourists with variations of pub culture in different parts of the UK. I ordered one of their daily specials, which was the Pork & Bacon Pie. I really liked pies like this after having a few of them in London so I couldn't resist ordering another. It was served over mashed potatoes in a gravy sauce. This was the most boring of all the pies I tried in the UK. This was filled with not much else besides ground pork and bacon. It was almost a meatloaf wrapped in a pie crust. Still pretty tasty. I decided I needed to try haggis while in Scotland. This happened at another pub called Fiddler's Arms. I knew exactly what I was going to order when I walked in. I had the Traditional Scottish Haggis, Neeps, & Tatties. The menu described this as haggis, mashed potatoes and turnips, drizzled in a homemade whisky cream sauce. My expectations weren't high for ordering offal meats in a bar, but what I was served far exceeded those expectations. The whole dish was constructed as a circular tower. There was a bottom layer of potatoes, topped with turnips, with the haggis above that, and then finally a sprinkling of greens at the top of the tower of food. The entire thing was drenched in the sauce which pooled at the bottom of the plate. Not only did it look good, but it was delicious too! I did find it humorous how my server came over after I finished eating everything and started telling me what haggis is made from. Hurray for scaring the tourists with organ meats! I had breakfast at the hostel I was staying at the next morning. Unlike the other hostels I stayed at in the UK, this one was serving a hot breakfast. It came with a poached egg, beans, sausage, haggis, black pudding, a potato cake, roasted tomato, and a type of puffy bread. Plain haggis was interesting, reminding me of scrapple from the Pennsylvania area of the US. Of the plain meats, I did enjoy the black pudding. Blood sausage is always tasty! Part Three of food from my trip to the United Kingdom. This post starts in London and ends somewhere in Scotland. I took a train to Edinburgh and there was food involved. My journey began at King's Cross Station. While I was waiting for my train, I ate breakfast at a restaurant called Leon. I had an egg pot consisting of a poached egg, smoked salmon, and sliced avocado. Small portion, but tasty. The UK has a somewhat complicated but simple train system. There are several different companies running their trains, but yet you buy your tickets from a centralized website. I ended up getting tickets with Virgin Trains. I guess they do more than airlines and spaceships. On board, they had a worker come through with a food trolley. In my head, this only happened on the Hogwarts Express. I'm glad there's reality behind food trolleys on British trains. They were giving out samples of biscuits in the train station, so I didn't partake in the food trolley. Was basically a chocolate chip cookie. After a wonderful train journey, I arrived in Edinburgh, explored the city (see the next post on the blog), and then it was time to take the train home. Without realizing it, I had accidently bought first class tickets for this trip. These first class tickets were cheaper than the coach tickets going to Edinburgh. I was good with my accidental upgrade. My previous long distance train experience was on an Amtrak Acela between New York and Boston. They advertised that entire train as being first class, but that got you pretty much nothing. On Virgin, first class actually means something. There were attendants coming though constantly offering all sorts of foods. This started with a bag of crisps. Cottage Pie with Root Vegetables came next. This was ground meat (beef or lamb?) topped with mashed potatoes cooked until crispy on top. The root vegetables included potatoes and beets. This is where I had fish & chips in England. They were located near Covent Gardens, but seemed to be a few blocks outside the really touristy area. I was told I should get fish and chips from a restaurant specializing in the food rather than eating it in a pub or elsewhere. Rock & Sole Plaice fit this criteria. I also wasn't a big fan of the fake malt vinegar served with the fish & chips. There was a bottle of malt vinegar flavored sauce on the table which I'm assuming was this. It was much weaker than actual vinegar and lacked the sourness. If I'm eating authentic fish & chips in London, I want actual malt vinegar to pour all over everything! In order to cross curry off the list, I got the recommendation to try The Rajdoot. This Indian restaurant had a small ground level dining room with more seating in the basement. It took me a moment to realize that I was hearing mostly American accents coming from the other diners in here. The restaurant was recommended to be by another American tourist. It was strange and the only place where I noticed this happening on my trip. I was trying to decide between lamb or chicken and the server recommended a dish called the Rajdoot since it came with both. Can't go wrong with a dish named after the restaurant. This was lamb and chicken tikka with onions and tomatoes. It was very tasty and wasn't one of the standard Indian restaurant menu items where you could get anywhere. My second Indian food experience in London was at a restaurant called Cinnamon. This was located on Brick Lane, which was a neighborhood lined with Curry Houses. Like New York's East Village Little India neighborhood, each restaurant had someone outside trying to get you to dine at their establishment. A restaurant called Cinnamon won my business for the evening. The meal started with papadum and sauces being brought to the table. Pretty standard as far as these go in Indian restaurants. What I wasn't expecting was the upcharge for this on the bill when it was automatically brought to the table. I ordered the Butter Chicken as my main course. There's no competition for this one. This was the worst butter chicken I've ever had. There was no detectable flavor besides butter and the sauce kind of separated resulting in a pool of melted butter over everything else. I've had butter chicken plenty of times before and have always liked it, but unfortunately I didn't finish most of this particular dish. In order to cross Yorkshire pudding off the list of British foods to try, I had to figure out where to get it because I wasn't finding it on menus. Turns out Yorkshire pudding is a side item served with Sunday Roasts in pubs. When Sunday came along, I took myself to a pub called the Marlborough Head. The Sunday Roast came with sliced lamb, mashed potatoes, boiled potatoes, peas and carrots, and the Yorkshire pudding. The lamb was nice and tender, drenched in gravy with an accompanying mint sauce. The rest of the sides were pretty standard and tasted as they should. The Yorkshire pudding ended up being pretty much equivalent to what I know as a popover. I like popovers, so I enjoyed the Yorkshire pudding and I was able to cross it off my list. My experience with a doner kebab was from a booth called Kebab & Burgers in the Camden Lock Market. This was another very cool market that I found accidentally. There was all sorts of booths selling foods and products located under railroad bridges and in old horse stables surrounding a lock in the nearby Regent's Canal. I actually had doner kebabs a couple more times while in London, but somehow lack pictures of them. Even the ones from very middle eastern neighborhoods were similar to this, with the main difference between them being the breads. The other two had everything stuffed inside a pita instead of wrapped in a flatbread. This was the first place I ate once arriving in the UK. I flew London, checked into where I was staying, and then decided to take a walk and start exploring my surroundings. I ended up in London's Chinatown. I walked by a very busy place called Chinatown Bakery. Along with all sorts of baked goods, they were making little custard filled fish called Tai Taki at a machine in the window. I was intrigued. The tai taki were pretty tasty. The cute little fish waffles were filled with very hot, creamy custard. I burnt my tongue on the first one because I wasn't expecting the filling to be so hot. Not long after I had the Chinese fish pastries, I ventured into a nearby Vietnamese restaurant called Keu. I'm still fuzzy on where one neighborhood of London ended and where another began (is neighborhood the proper word? ), but I believe this restaurant was in Soho. I had a banh mi at Keu. The sandwich was not unlike the banh mi sandwiches that I've had back in the US. It was pretty standard with various parts of pig and pickled vegetables served on a French baguette. The first sandwich ever put into my stomach from Europe filled me up! The next morning I had breakfast at a restaurant called EAT. Turned out these were a chain that seemed to have locations around every corner. I ordered an egg pot. This consisted of a poached egg, served over baked beans and topped with avocado and ham hocks. I like the whole beans for breakfast thing. I stumbled on Borough Market my accident. It wasn't initially on my list of places to see in London, but walked into it on my way somewhere else. It was a good find because I returned a couple more times during my time in London. I would rank Borough Market as one of the best food/farmers market I've come across anywhere in my travels so far. The closest food market I've come across to compare was Reading Terminal Market in Philadelphia, but Borough Market far surpassed it. They had every sort of food imaginable, both ready to eat and fresh. The first food I had from Borough Market was from a booth called Pieminister. They had all sorts of meat pies. I tried the Matador. It was filled with British beef steak, chorizo, olives, and butter beans. I had it with a side of creamy mash and gravy. I had food from a booth called Nana Fanny's on the second time I visited Borough Market. This booth served an interesting combination of salt beef and falafel. I was tempted by the falafel, but the salt beef preparation looked more fun. I ordered a sandwich on rye bread. I had the option to get it on a bagel, but the rye seemed more proper for this type of sandwich. The sandwich consisted of thick slices of the salt beef, cheese, cabbage, pickles, and mustard. The beef was sliced right there, as was the cheese (from a huge wheel), then melted with a blowtorch. It was entertaining to watch when a paper plate caught fire a couple sandwiches ahead of mine. It was similar to a New York style Kosher deli sandwich, only with cheese and more toppings. I liked it! I stayed at another hostel in Soho while in London where I purchased breakfast one morning. It included a croissant, cheese, and tea. Not much, but it did the trick for breakfast. This was a similar style coffee/breakfast shop to Eat, but not nearly as prevalent. Greggs had a little more of a Dunkin Donuts feel. I had a bacon and egg sandwich with brown sauce. British bacon is interesting. More like ham that was cooked until crispy rather than the American style fatty bacon. The booth had several pots of various meats and side dishes cooking. I ordered the mixed meat box. When I overwhelmed with what I should choose, they made me a dish with a little of everything in it. There was chicken, lamb, potatoes, spinach, lentils, and more that I'm forgetting, all served over half rice and half couscous. It was all delicious! While wandering around Greenwich after leaving the market, I walked past Paul Rhodes Bakery and saw a tower of some of the most beautiful meringue cookies I've ever seen. Their window display worked because I went in and bought a raspberry meringue. Unfortunately, they looked better than they tasted with a very weak raspberry flavor and the chalky texture got old quick. I almost skipped London's famous department store. When I walked past on my way to a museum, I decided to step inside on a whim. I didn't realize the huge food section that they had in here! Upon seeing all the deliciousness, I found myself at the pastry counter and ordered a cream cheese & peach vatrushka. I'm not sure if I've ever had a vatrushka in the past, but the thin slices of peach over a cheesy filling, all in a cake-like bread was very tasty!